In order to be fit and healthy kids need exercise. The problem is, if they don’t find exercise to be fun children aren’t likely to continue it. Many parents have found that by purchasing a trampoline, they have no trouble at all convincing their kids to get plenty of daily exercise! Today’s kids are fatter than ever. If that sounds blunt, it is meant to be. Years ago, overweight kids were in the minority, but these days, you don’t have to look far to notice that a lot of kids and teens are considerably overweight. In fact, childhood obesity is now considered by many health experts to be the biggest risk factor for this entire generation of children. Statistics show that children born today represent the first generation in recorded history to have a lower life expectancy than their parents. That prediction does not have to prove true, however, but in order to turn it around, parents must make healthy eating and fitness high priorities for their families. Today’s parents have their work cut out for them when they try to get their kids up and exercising. Unfortunately, kids are often more inclined to watch a video or play computer games than they are to participate in a sport. Nonetheless, parents cannot afford to give up trying. For some families, something as simple as jumping on a trampoline can convince the children that they’d rather be exercising than playing video games. 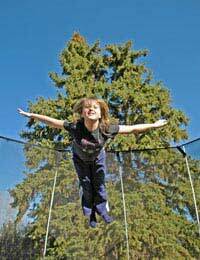 Self-confidence builds as kids learn to master trampoline jumps and flips. Social contacts – the presence of a trampoline tends to attract neighborhood kids! As with all forms of exercise, consistency is key. Occasional activity is better than nothing, but in order to reap the full fitness benefits that trampolines offer, it is recommended that kids play actively on them for at least 2 ½ hours weekly. Most trampoline owners have no trouble getting their kids to meet that minimum – in fact, they may have trouble getting the kids to come back inside for meals! As with all pieces of exercise equipment, proper usage is necessary to keep kids safe. Trampolines should be of high quality and installed exactly as the manufacturer recommends, on flat, level surfaces. Parents may want to consider the use of an attached safety net, especially for young kids. All children should be well supervised when jumping, and kids should be made aware of the safety rules before they are allowed to step onto the trampoline mat for the very first time. Parents may even choose to post a list of rules near the trampoline site so that family members as well as visitors are completely aware of the right way to use the trampoline. While trampolines can provide thorough and fun workouts, spills can sometimes be nasty. Trampolines come with recommendations for their safe use and these suggestions should be taken seriously. Happy jumping!